Hi everyone, I hate the fact that I'm being such a bad blogger lately, and I'm really looking forward to being back creating, posting and entering challenges soon. Unfortunately, due to a family illness we're spending a lot of time travelling up and down the country at the moment and everything else is taking a back seat to these real life problems. I have quite a few birthdays coming up soon for 'special people' though, so I've had to unpack my Mojo and get cracking! The first VIP birthday is for my beautiful DIL on 30th May and I'd already made her card from us, so I just needed to make a card from my Mum and that would be it.....or so I thought! My darling son arrived on Saturday to ask if I'd make a card from him. Now I don't mind at all as I love making 'girly' cards, but he never has any ideas about the sort of thing he wants and leaves it totally up to me which can make things a little difficult, to say the least! Anyway, I made the card (he hasn't seen it yet so I hope they both like it lol!) and this is it. I used an 'envelope template' which I purchased through Joanna Sheen's forum last year to help raise money for a charity, but had never got around to using. I think I quite like the final result, at least it's something a little bit different from my usual cards. This is the card I made for DIL from my Mum and I've used one of the sweet little 'Miss Anya' images that I recently received in a RAK. My DIL loves her designer bags, so I thought this one would be right up her street, I've used quite a lot of glitter on this card too so it's extra 'girly', unfortunately you can't see it on the scan. I have my son's birthday coming up on June 10th, my nephew's on 20th and my best friend's on 28th, so even if I don't manage to do much else, I'll be posting these. Please accept my thanks for your continuing visits and wonderful comments, they're really cheering me up! 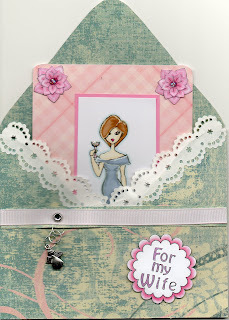 Fabulous work Chrissie - love both cards. 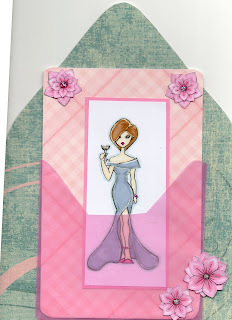 What a beautiful cards Chrissie,l love the images and colours. Lovely to see these two beautiful cards Chrissie. Your DIL will love them I'm sure. 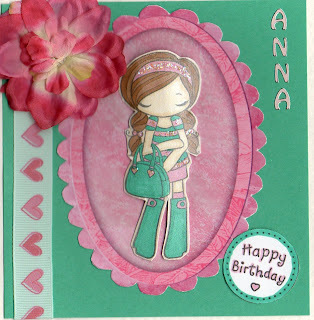 Two very beautiful cards Chrissie love them both so glad you could post them. Hope everything will be ok and look forward to your return. These are soooo beautiful!!! Wow love them both! these are gorgeous Chrissie, i am sure that they are going to be loves. Beautiful and so different. Everything perfect. They will both absolutely love it Chrissie and your mojo certainly hasn't gone rusty, that's for sure!